UFPs and DFPs each have a CC1 and a CC2 pin. These pins connect to the CC and VCONN lines of the Type-CTM cable. Both CC1 and CC2 must be able to support both the CC and the VCONN functions. Upstream facing ports (UFPs) are connected with the pull-down resistor (Rd) on CC1 and CC2. Type-CTM cables are populated with only one CC line. 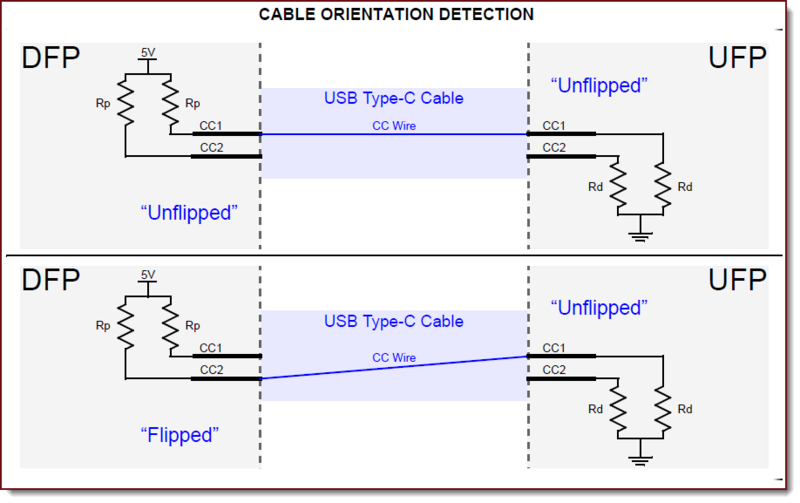 By monitoring both CC1 and CC2 the DFP can determine if a cable is connected and the orientation of the cable. Powered Type-CTM cables, both electronically marked and managed active cables, have pull-down resistors (Ra) connected to the non-CC line. Monitoring Ra allows the DFP to recognize the existence and orientation of a powered Type-CTM cable. How Much Power can the DFP supply ? VCONN is a 5 V 1 W power supply used to power the IC within an electronically marked Type-C cable. The DFP will supply the VCONN power upon start-up. If a valid Rp/Rd connection is detected on one of the CC pins, VCONN can be connected to the other pin. After a valid Rp/Rd connection is detected on one CC pin, the other pin is monitored for a valid Ra before connecting VCONN. 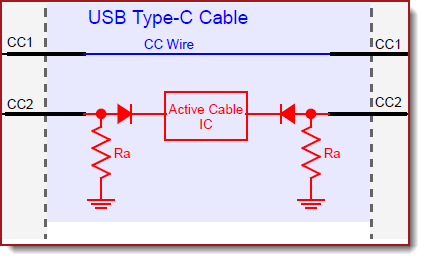 Because of the reversibility of the cable, both the CC1 and CC2 pins must be capable of assuming the roles of CC and VCONN.